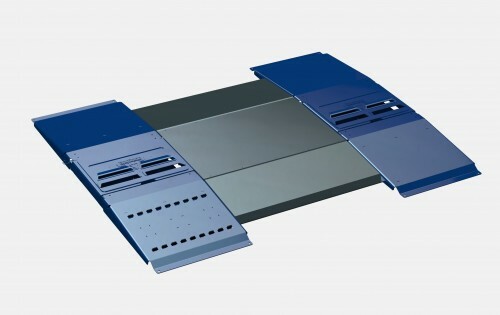 The TreadReader Drive Over ramp is a fully automated tyre wear measurement system that can be configured for passenger cars and light commercial vehicles. Compact TreadReader laser sensors are housed in a surface mounted ramp with little or no groundworks or preparation to the road or workshop floor. Sensors can also be integrated into other workshop equipment, e.g. lifts, wheel alignment machines, brake testing machines and vehicle inspection lanes. The tyre passes over a pressure switch to trigger the measurement of a tyre patch approximately 50mm (3”) wide. Around 300,000 data points on the tyre patch ensure accurate and repeatable measurements, even if tyres are wet or dirty, with an accuracy of < 0.2mm or 0.008”. The system is kept clean by the use of air knives and a shutter mechanism. The patented TreadReader tyre measurement technology creates a detailed 3D scan of each tyre, constructed from 300,000 measurement points, with an accuracy of < 0.2mm or 0.008”. By scanning the full width of the tyre and 50mm around the tyre, TreadreaderTMdevices far surpass the accuracy and reliability of traditional dip gauges and non-contact ‘laser pointer’ measurement devices. Advanced software algorithms produce detailed 3-dimensional tyre tread images which show the condition of the tyre tread with absolute clarity. When presented to a vehicle owner, TreadReader scans immediately convey tyre condition and remove any perceived barriers to tyre replacement should tread depth be insufficient or illegal. Tread depth measurement occurs as the vehicle drives over the ramp and the tyres pass over a pressure switch on the leading edge of each ramp. This also triggers the opening of the shutter above the sensors. At the same time, air knives are activated to clean the laser scanning sensors mounted inside the ramps. A maximum continuous vehicle speed of 8mph is permitted. 3D tyre scans are captured and communicated over Ethernet to the PC. A software license is provided to run TreadReader™ software on the PC. The software analyses tyre scans and calculates tread depth. The 3D tyre scan images, tread depth measurements and operator recommendations are then displayed on the PC. Additional narratives can also be provided when edge wear is detected.